Liners – Shoulder pad liners are designed to be snug fitting, low profile pieces that offer sternum and collar bone protection but do not have bulkier shoulder padding or arm padding. Liners are primarily worn by more advanced players that are shedding padding for better mobility and are playing either middie or defense. Liners trade less protection for more mobility. An example of what a liner looks like is below. 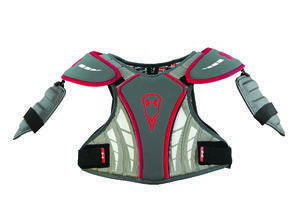 Shoulder Pads – Traditional lacrosse shoulder pads offer more protection than liners and are worn by advancing youth players and older offensive players that are getting checked often. Most advanced attackman opt for shoulder pads rather than liners even at the high school and collegiate levels as they want the extra shoulder and arm protection. Youth players should wear the most protection possible. An example of what a shoulder pad looks like is below. Many current shoulder pads are sold with fittings that allow the player to remove or adjust the protection as needed. We recommend that all players under the high school level stay with a traditional shoulder pad to protect them as they grow. Never alter or cut your pads unless specified by manufacturer. The general rule of thumb is that both liners and shoulder pads should fit snugly. 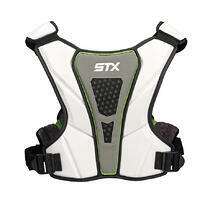 Here are some general sizing suggestions when purchasing lacrosse shoulder pads. If you have any questions about lacrosse shoulder pad sizing give one of our collegiate pros a call at 855-255-5294 or email questions@lax.com. Also, be sure to get the free Lax.com mobile app. We offer some exclusive deals and you will also get access to some of our everyday specials. See you on the fields! ** Lax.com makes no representation of the safety or suitability of any of these pads. We are relaying the information regarding what most of our customer are buying based on age and size. Please refer directly to the manufacturer for suggestions or sizing guidelines.